Through the Community Program organizations contribute their local geographic content which is published and freely-hosted by Esri. Everything from basemap layers such as parks and trees, to imagery and stream gauge data can be contributed. This month 18 communities have shared map layers in support of Esri’s expanding suite of high-performance basemaps and imagery services. Map layers include aerial photography, boundaries, buildings, owner parcels, parks, points of interest, trees, and similar large-scale features that enhance our products and information sets for the world to use. 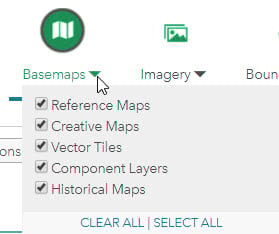 Detailed large-scale basemap layers and high-resolution imagery shared to the Living Atlas are what sets ArcGIS Online Basemaps apart from other mapping APIs. The Story Maps below include examples of these map layers and stunning imagery from our latest release. The Community Maps Program is going through many enhancements, including updates to the Community Maps Contributor App, The new version of the app offers an improved user experience, a new option for sharing map data, and better ways for our contributors to manage their accounts and the content they share. Have a look at these short segment videos for the details. The ArcGIS Living Atlas of the World is a collaborative effort between users, partners, and Esri. Whether it’s contributing data or nominating your maps and apps, there is a way for you to get involved. Click the image below for details on how to get started. Stay in touch! A great way to keep up to date on Living Atlas enhancements, new content and success stories is to subscribe to ArcGIS Living Atlas Gems. Click the image below to read the latest issue! Earlier this week I showed how we can use the Trace Downstream service in ArcGIS online to predict where lava will flow. The night after the blog was posted, some lava flowed from some of fissures in the Eastern Rift Zone downward toward the sea. 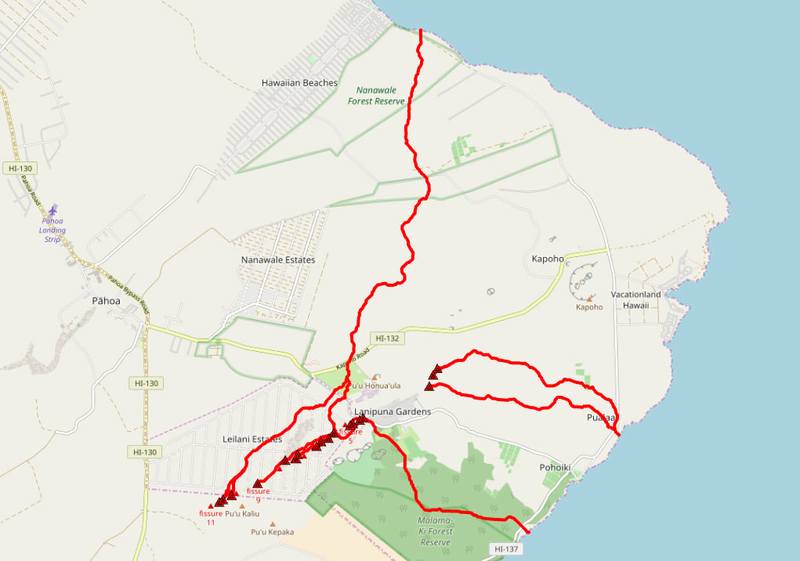 The path taken by the lava flow followed the line ArcGIS had traced downstream from the fissure. As of Friday afternoon Pacific Time, Open Street Map shows the lava flow has been following the course the new 10m trace downstream service had predicted. The flow has mostly stopped, but if it starts again and continues to the sea, it will overrun Ahalanui Park. The County of Hawaii advises us that both Isaac Hale and Ahalanui Park are closed until further notice. Find out how to get the most accurate global elevation data for your visualization and analysis. Airbus’ WorldDEM4Ortho is now part of ArcGIS Living Atlas of the World. 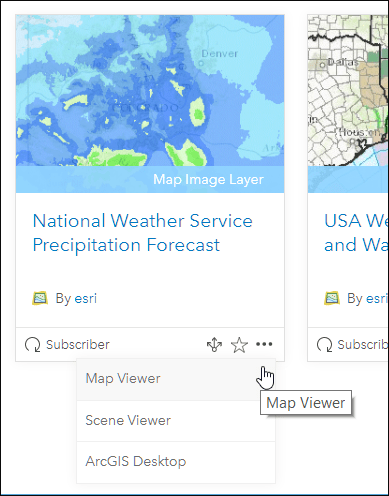 Anyone with an ArcGIS subscription can use it. In this webinar you will learn more about WorldDEM4Ortho—how it was created and why it’s so accurate. You will see how to access and use the Living Atlas global elevation services that contain WorldDEM4Ortho. Most consistent and accurate satellite-based elevation model on a global scale. Vertical accuracy of ~ 4 meters. Pole-to-pole coverage at ~ 24 meters cell size. One of the core layers the Living Atlas of the World provides is a digital elevation model (DEM) of the planet. These data are shared as cached basemaps and as an image service, as well through a suite of analysis tools you can use directly against the hosted data. The Hydrology Analysis Tools – Delineate Watershed and Trace Downstream – use elevation to help you understand hydrologic connectivity across the landscape. These are foundational services with applications in natural resource management, ecology, public health, and disaster response. For example, when a waterborne contaminant is found at a particular location, you can use these tools to narrow down the upstream area it could have come from, and chart where it will flow next. Users can perform these analytical tasks quickly and easily without having to collect, maintain, or update terabytes of base data on local machines. 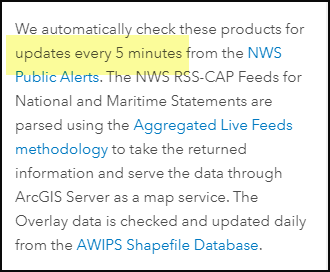 The data is already preprocessed, optimized for fast web service performance, and is readily accessible across the ArcGIS platform. Globally this analysis is based on the 90-meter resolution HydroSHEDs DEM, and in the United States the tools also take advantage of the 30-meter resolution National Hydrography Dataset. However, some islands remain too small to represent with these datasets, even making use of the increased resolution of the NHD. Now that the USGS has begun releasing 10-meter resolution, hydrologically-enforced DEMs for the United States, we can finally add support in Hawaii, Puerto Rico, Guam, and the U.S. Virgin Islands. This is the first 10-meter resolution data to be incorporated into our Hydrology Services. 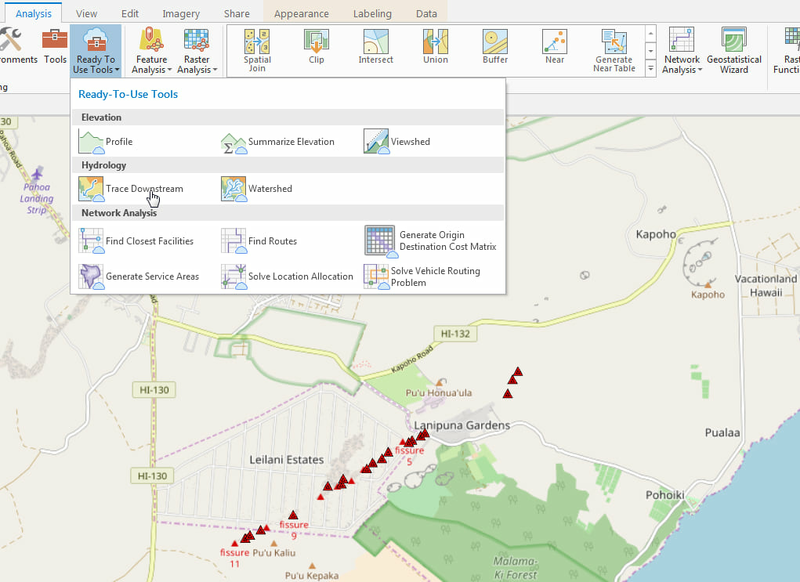 These tools can be used by any application in the ArcGIS platform. If you are developing an application of your own, you can use the REST API to incorporate them into your project as well. 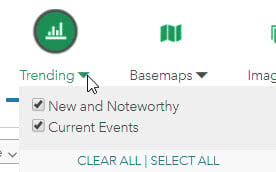 In ArcGIS Online, just press the ‘Perform Analysis” button and click “Find Locations.” The tool lets you input a set of points, or you can just click on the map on your point of interest. In ArcGIS Pro, these analysis services are accessible as Ready-To-Use Services in the Analysis ribbon. 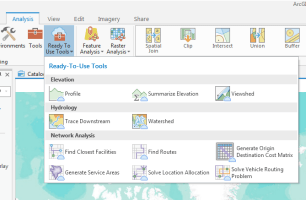 Ready-To-Use Services give direct access to ArcGIS Online analysis services such as Network Analysis Services as well as elevation and hydrology services. Access them by logging in to any ArcGIS Online organizational account. These tools can be used directly in ModelBuilder models and Python scripts just like any other geoprocessing tool. In ArcMap, you can find them at the bottom of the Catalog window. Expand Ready-To-Use Services, click the Elevation connection, and then the Tools folder, and Elevation toolbox. A pop-window will prompt you to log in. These services require that you have an ArcGIS Online account with credits available to you. For every thousand features you input to the tool, one credit will be deducted from your account. There is new and updated content for 22 communities. This release includes several states, counties, cities, conservation areas, and facility sites throughout Canada, Switzerland, and the United States, as seen in this Story Map. If you have other feedback or comments, please post them to the Living Atlas Discussion Group on GeoNet. If you have previously used any basemap service, you may need to clear your cache in order to see the updates. 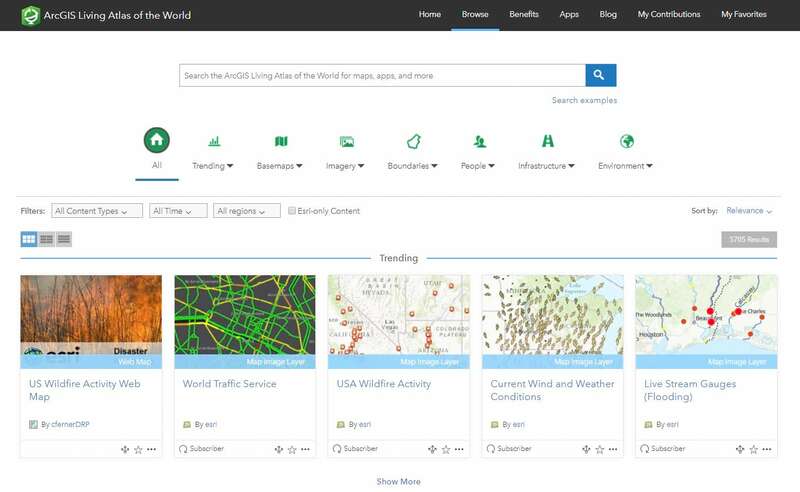 The ArcGIS Living Atlas of the World is one of the places you can search for content when you want to create a map. For example, when you search for and add content using the Map Viewer, the Living Atlas is one of the places you can search. 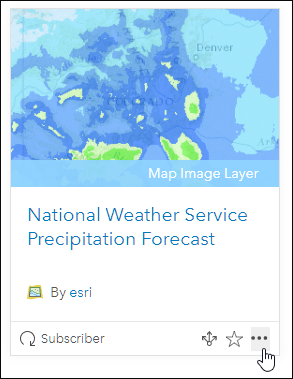 But another place you can start authoring your map is at the ArcGIS Living Atlas of the World website. By starting at the Living Atlas website, you have access to full browse and advanced search capabilities against Living Atlas content. You can also favorite Living Atlas content for easy access in the Map Viewer. Here’s how to leverage the website for your map authoring needs. Step 1. Go to the Living Atlas website and sign in. Step 2. Click the Browse tab. Step 3. Use the browse tools to find what you want. There are lots of search options you can use to zero-in on content you’re interested in. For example, you can enter a keyword in Search. Click Search examples to get some hints, or just enter any search string. You can also choose from Living Atlas topics. Click to open and choose subtopics you are interested in. And you can search for specific content types, like maps or layers, choose a specific region, and more. Use the various tools noted above, when finished browsing, peruse your results. Step 4. Learn more about your results. Click the thumbnail, or title, to open the item details for your search results. The item details provide additional information about your results that help you decide what to use. Step 3. Make a map using your results. Click the context menu (3 dots alongside your results). Then choose the application to open, in this case we chose Map Viewer. 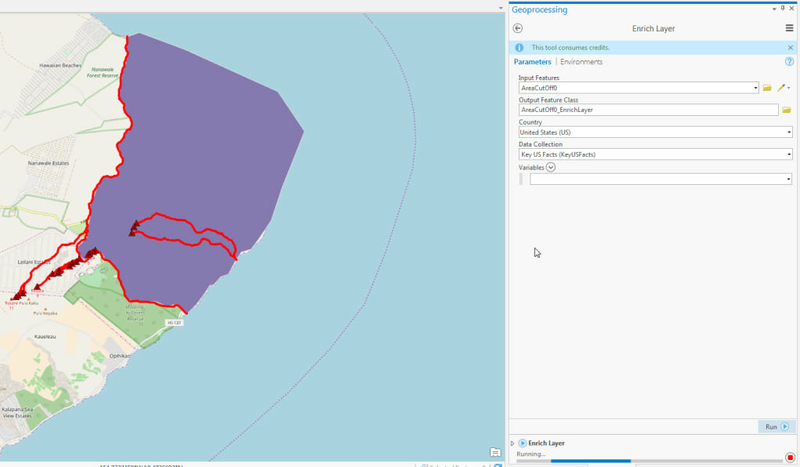 You can also open the item in the Scene Viewer, or ArcGIS Desktop. Once the Map Viewer opens, your Living Atlas layer will appear, and you can continue authoring your maps using the Map Viewer. You can also favorite items you find at the Living Atlas website. Click the star to favorite any of your search results. And can also be used in the Map Viewer. Click Search for layers, then select My Favorites. This change will primarily affect image computation and analytics, where numerical and visual results may vary. This change does not impact the visualization of band combinations and indices provided by Esri and does not impact user-defined raster functions which do not involve image computation. The scale range will now be equivalent to other TOA reflectance products, including those provided by the USGS. This change simplifies the computation of indices such as NDVI. Users should account for the revised scaling accordingly. Daily updates. The service will now be updated daily. Minimizing the time between data capture and data availability is important for users who rely on the most recent data. New QA band. The service will now include a QA band as band 9. This layer is provided with the Collection 1 data for assessing general quality conditions within an image. For more information, please reference Landsat Collection 1 Level-1 Quality Assessment. New field. Our Landsat Image Services will continue to provide both Pre-Collection and Collection 1 data. A new field called Landsat_product_id has been added to distinguish between the two. For more on these collections, see Landsat Collections. WCS and WMS compatibility. 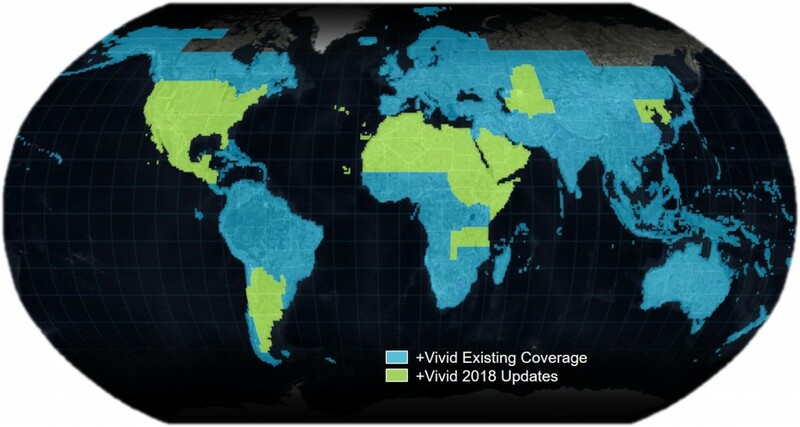 The Landsat Image Services will now include the ability to be consumed as WCS or WMS services. Due to the change in output range of pixel values, the image services update will affect users who use the services for processing and analytics. The following apps, services, and tools will be affected. Minor modifications will be made to the computation of indices. All the functions will be updated resulting in a change in the raw values. Web map functionality will not change. Minor modifications will be made to the computation of indices. If you are using the Add-in, you will need to update it. Some layers in your web map may be dynamic, meaning they are being updated at regular intervals. For example, a GeoRSS feed, earth observations from the Living Atlas, or a feature service being updated by workers performing edits while in the field. When the map containing these layers is redrawn, these data refresh. By setting the refresh interval property on these layers, you can force an automatic refresh at a specific time interval. These refreshes occur even while the map is open and idle, and will synchronize the map anywhere it is accessed – via browsers, desktops, and devices. 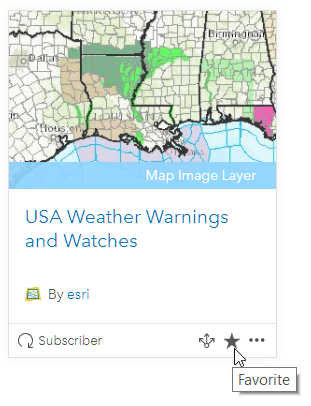 USA Weather Warnings and Watches is one of the curated earth observation layers available in the ArcGIS Living Atlas of the World. 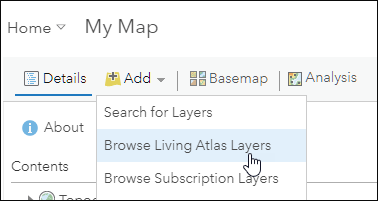 To add the layer to your map, click Add then choose Browse Living Atlas Layers. Searching for “weather” we can find the USA Weather Warnings and Watches live feed from the Living Atlas, and add it to our map as a layer. Click (+) to add it to your map. Viewing the item details we learn that the service is checked for updates every 5 minutes. To view the details, click the title (or thumbnail if in List view). Scrolling through the item details, we learn the service is updated every five minutes. To set the layer refresh to match the update interval, open the layer options, choose Refresh Interval, and set it to 5 minutes. The interval must be expressed in minutes, but can be in the range 0.1 (6 seconds) to 1440 (1 day). This ensures that even when the map is not being actively used, the layer will refresh to show the latest updated information. The layer properties are saved with the map, and the layer will automatically refresh at the specified interval when viewed, even if the map is left idle. 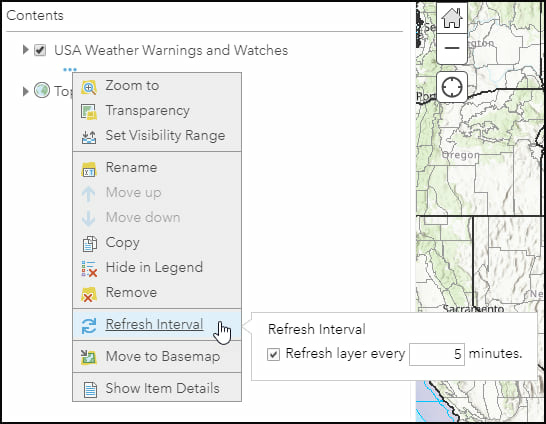 View a sample web map using refresh intervals. The web map has two layers (USGS earthquakes past hour and past day) that update every 5 minutes. Update intervals can be different from layer to layer. This post was originally published on September 25, 2013, and has been updated. 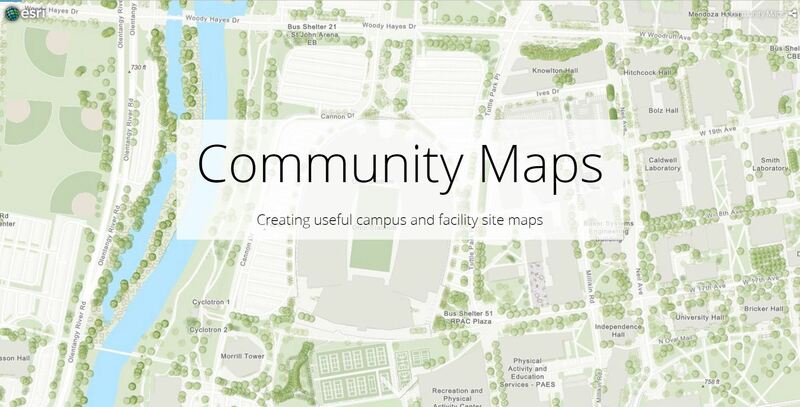 Contribute Your Campus Data to Esri's Community Program! Community Maps contributors have made it clear, and we’ve noticed. 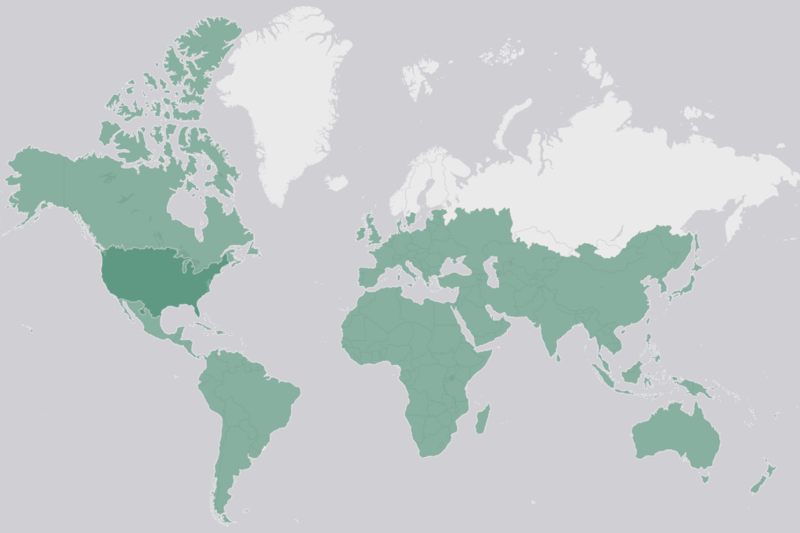 Colleges and universities all over the world want their campus on the map. There has been a rather impressive increase in the number of campuses that want to share their content with Esri’s Living Atlas of the World. Just click on these interactive maps to view a few of the campuses we have helped complete maps for. Sure, there are many campuses that maintain campus maps already. The Living Atlas team at Esri would like to offer an additional resource. What’s the benefit? Maybe you should ask yourself, how will your campus benefit by not participating and sharing your map content. We’d like to help your campus get on the map. Here’s what you get and how to do it. Faculty, students, and facility managers will all have access to the same online basemaps, derived from and maintained with the authoritative content provided by the educational institution’s data stewards. The online basemaps can then be used to manage your facilities, highlight student life, activities and events. Like this Building Energy Explorer App. It Calculates and compares the Energy Use Intensity (EUI) for UMass buildings and associates this data with a map to visualize and analyze energy consumption across the campus. 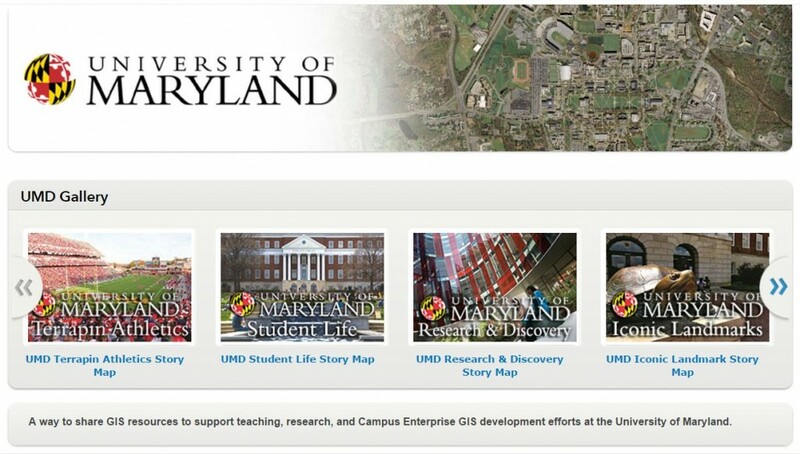 Assemble all your campus apps by creating a map gallery on ArcGIS Online, it makes it easy for students, faculty, and staff to find information they need. Ensure featured content about your campus is easily discoverable. 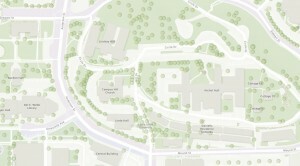 Create a Living Atlas of your campus! Why Esri’s Community Maps Program? When you participate in Community Maps, your campus data will be integrated into a suite of ready-to-use online basemaps. 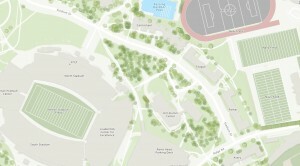 Contributing your campus data, whether it includes building footprints, sidewalks, or vegetation data, provides your internal users and the public with access to a unified, cartographically well-designed campus map. The campus map can be accessed through a standard Internet browser, ArcGIS® for Desktop, ArcGIS® Pro, ArcGIS for Smartphones and Tablets, or custom applications. Participation in the program is free, and a wealth of resources is available to you. Just email Shane Matthews (smatthews@esri.com), I can help you out! Or register for Community Maps here, and we’ll contact you with the next steps. This Story Map illustrates the building blocks of large-scale content, features select contributing campuses, and provides examples of applied use. 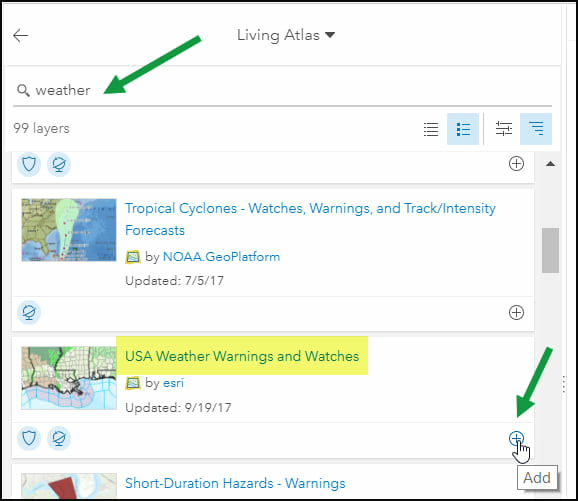 The ArcGIS Living Atlas of the World has been updated to use new categories for item organization. The categories more closely reflect conventional topics and industries. The categories and subcategories have been consolidated into logical groupings making item discovery more intuitive. Items will be included in only one, and at most two, categories. The new categories will also allow faster Living Atlas contribution. While a few new categories have been added, many remain the same or have become subcategories. A Trending category has been added where content that is new and noteworthy or related to current events will be featured. Content in this category will be updated frequently. The most notable updates to the Basemaps category is the addition of the Creative Maps subcategory and the Vector Tiles subcategory. This means users can more readily take advantage of the benefits these maps offer. The categories have been updated on both the Living Atlas website and in ArcGIS Online. The updated categories can be seen on the Browse page of the website. For the nomination process, this means contributors will no longer have to add Living Atlas specific tags to their items. However, the recommendation is to still include at least three tags when nominating items for the Living Atlas. To learn more about the criteria for Living Atlas item contribution, please read “A Simple Checklist for Nominating Your Maps and Apps into the Living Atlas”. To prepare and nominate items to the Living Atlas sign in to the My Contributions page of the Living Atlas website using your ArcGIS Online credentials. 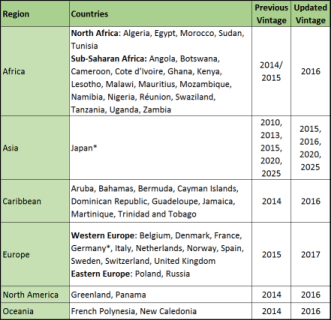 For more information regarding the category updates in ArcGIS Online, please read “What’s New in ArcGIS Online (April 2018)“. Just because you can’t see evapotranspiration doesn’t mean you can’t map it. In fact, the Living Atlas of the World has long contained data about average annual evapotranspiration for the United States. Today that map is being deprecated and replaced by two global versions that show evaporative losses everywhere on Earth. Evapotranpsiration is the measure of evaporative losses from the landscape. It includes both direct evaporation from lakes and soil, and transpiration, which is when plants take water up through their roots and release it from their leaves. Over 61% of rainfall is lost to evapotranspiration, so mapping its variance is an important part of understanding the global water cycle. Potential evapotranspiration is the amount of evapotranspiration that would occur if water availability were unlimited. It is a meteorological variable that depends only on air temperature and solar radiation. So, for example, Scotland and Norway have a lower rate of evapotranspiration than the Congo, despite receiving just as much rain, because potential evapotranspiration is lower. There is not enough solar energy to vaporize all the water. Conversely, the Sahara Desert has a very high potential evapotranspiration, but receives little rain, so actual evapotranspiration is low and the unused solar energy heats the sand to over 170 degrees Fahrenheit. In the Congo River Basin, there is high potential evapotranspiration and ample precipitation, so less of the potential goes unused. The result is high actual evapotranspiration and a much more humid climate with abundant plant life. These layers were built using the MOD16 Global Evapotranspiration Product, which is derived from satellite imagery by researchers at the University of Montana. Imagery is from the Moderate Resolution Imaging Spectroradiometer (MODIS), an instrument with 1-km resolution first launched in 1999 and carried by two NASA satellites. The MOD16 algorithmderives from raw imagery a number of secondary data products like land surface albedo, leaf area index, and net solar radiation. These intermediate data are used to solve the Penman-Monteith equation for total daily evapotranspiration, which is then aggregated into 8-day, monthly, and annual intervals. We calculated the average annual evapotranspiration over the 15 year period of record (2000 – 2014), both in terms of actual and potential ET, in order to build the layers above. If you want to access the monthly data, a toolbox you can use is available here. These layers are image services, so they can be used as input by your geoprocessing tools in Desktop. The “Zonal Statistics as Table” tool is particularly useful for calculating evaporative losses over a watershed, which is the first step towards calculating the water balance. If you subtract annual evapotranspiration from the annual rainfall you have a good estimate of available water, the sustainable supply of a watershed that must be split between human use, freshwater ecosystems, and groundwater recharge. For visualization purposes there is also a cached version of this map that has a hillshade burned in. 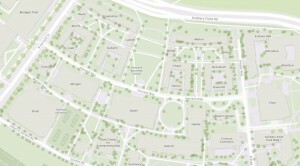 When combined with the Hydro Reference Overlay it can be used to create a particularly beautiful basemap. 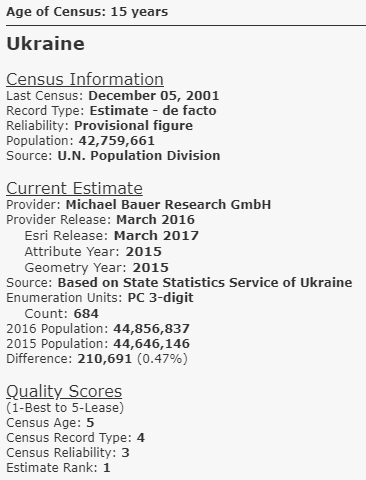 We are pleased to announce the availability of an update to the World Population Estimate layers. Within Europe and North Africa, confidence in population estimate varies tremendously. This is based on age of census or estimate, size of available enumeration units, the quality of the census, etc. The geoprocessing model used to create the surfaces was restructured to eliminate statistical artifacts which affected the model’s ability to determine an appropriate threshold for human settlement, especially in coastal areas. To improve upon this previous version we switched to a Top of Atmosphere (TOA) corrected Landsat8 panchromatic dataset. TOA effectively normalizes statistics between scenes. We are also pleased to include that Esri participates in the POPGRID Data Collaborative, which is a consortium of those who produce global and national gridded population estimates and redistributions. POPGRID seeks to facilitate collaboration among data producers and inform users about the differences in purpose and utility of existing gridded population datasets. The 2016 World Population Estimate layers are found in the ArcGIS Living Atlas of the World. 2016 Methodology White Paper that provides detailed documentation describing the nature of the WPE, how it is produced, and recommendations for successful use. This example shows the kind of information available for every country. We are Everywhere story map that introduces the WPE and possibilities for gridded population data. Elevation surface provides foundational layer for your work in 3D. ArcGIS 3D clients such as ArcGIS Pro, ArcGIS Online Web Scene Viewer, and ArcGIS Earth comes with a default elevation layer – Terrain 3D. Along with this default elevation layer, ArcGIS Living Atlas of the World also provides TopoBathy 3D, which combines topography (land elevation) and bathymetry (water depths) into one seamless layer. Terrain 3D and TopoBathy 3D are tiled elevation services that uses the LERC (Limited Error Raster Compression) tile format and are derived from World Elevation Terrain and TopoBathy respectively. A few weeks ago World Elevation layers (Terrain & TopoBathy) and Tools were enhanced with Airbus WorldDEM4Ortho. These updates are now rolled out to 3D elevation layers (Terrain 3Dand TopoBathy 3D). Airbus WorldDEM4Ortho is a global dataset covering the entire earth’s land surface (excluding the countries of Azerbaijan, DR Congo and Ukraine), which has a resolution of 0.8 arc second (approx. 24 meters). It brings many quality improvements especially over urban areas in Europe, Asia, Africa and South America, which were previously using SRTM 30 m dataset. SRTM is a digital surface model (DSM), which represents elevation values of the natural and built features on the earth surface such as buildings, vegetation, etc. Due to its DSM nature and coarser resolution, urban areas especially with dense and high rise buildings appear to have small hills or undulating surface. When you overlay 3D buildings/objects on this undulating surface, it seems to be either sinking or floating on the ground. In Airbus WorldDEM4Ortho, urban areas are flattened to give DTM-like product thus providing much better surface than SRTM 30 m. Let’s see a few examples showing improvements over urban areas in before and after comparisons. Auckland, New Zealand – 3D buildings are now sitting nicely on flat ground surface (WorldDEM4Ortho 24 m) in comparison to previously undulating surface (SRTM 30 m) where buildings seem to be sinking in the ground. Berlin, Germany – 3D buildings are now sitting nicely on flat surface of WorldDEM4Ortho 24 m (after) in comparison to undulating surface of SRTM 30 m (before). 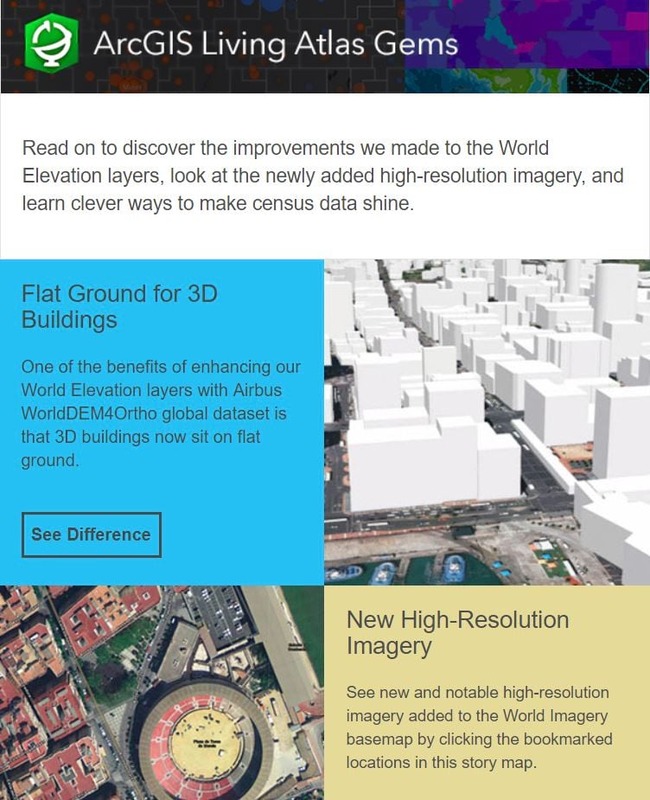 Esri will keep improving the World Elevation Layers, Tools and derived information products with high resolution content from open sources and community maps for elevation program. You can look at the current data sources used by checking our Elevation Coverage Map. If your organization has better elevation content that they can contribute, then check our Community Maps for Elevation program to get in touch. If you are interested in learning more about various elevation information products in the ArcGIS Living Atlas, then take a tour with this elevation story map. The ArcGIS Living Atlas of the World contains vector and raster layers for lands managed or owned by six agencies of the federal government (US Fish and Wildlife Service, National Park Service, US Forest Service, Bureau of Land Management, Bureau of Reclamation, Department of Defense). Last week, these Esri owned layers were updated, including the addition of two new agencies, more accurate ownership attribution, faster drawing speeds, and access to the latest features in ArcGIS Pro. The new USA Federal Lands feature layer is best for visualization at larger scales (> 1:2,000,000) and can be combined with an imagery layer or a tile layer in a web map to provide fast rendering across the entire range of scales. 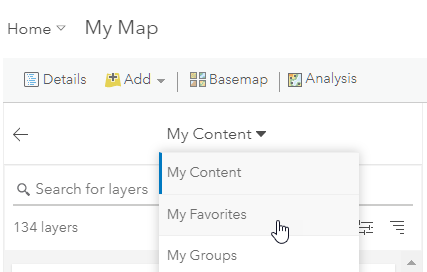 In ArcGIS Online you can export the feature layer’s data, perform analysis, change symbology, and work with the layer’s attribute table to select features and edit data. In ArcGIS Pro you can do even more including using the layer as an analytic input to a geoprocessing tool, model, or Python script. Imagery layers are useful online to rapidly draw across the entire scale range and can be used in web maps to support the feature service at smaller scales. Imagery layers are particularly useful in ArcGIS Pro where you can use functions to extract, modify, and combine imagery layers on the fly to create landscape models that reveal patterns in the data. 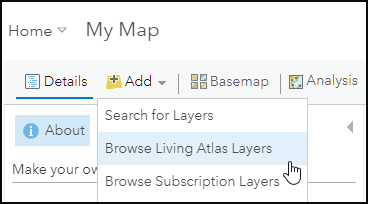 These layers are part of the ArcGIS Living Atlas of the World, which provides an easy way to explore many other authoritative maps on hundreds of topics like this one. It is looking to be a very productive year for our Community Maps Program. Over the last two months we have updated our World Imagery basemap with high-resolution aerial imagery contributions ranging from 4 to 30cm. See What’s New in Community Maps Imagery (2018) to explore a series of bookmarked locations and a full listing of 2018 Community Maps Imagery publications by month.